My family lives in a fun little mid-century house a few miles north of downtown San Antonio. My wife and I fell in love with it early on and it has proven to be a great home for our family that has somehow doubled in size since we moved there. The only thing we didn't like about the house was its front door. Although some found it quite appealing, its style didn't match the rest of the house and it didn't close properly so that during certain times of the day you could see daylight streaming in underneath it. We intended to replace it shortly after we moved in but somehow didn't get around to it until a few weeks ago when the stars finally aligned and we were able to find a more fitting replacement. 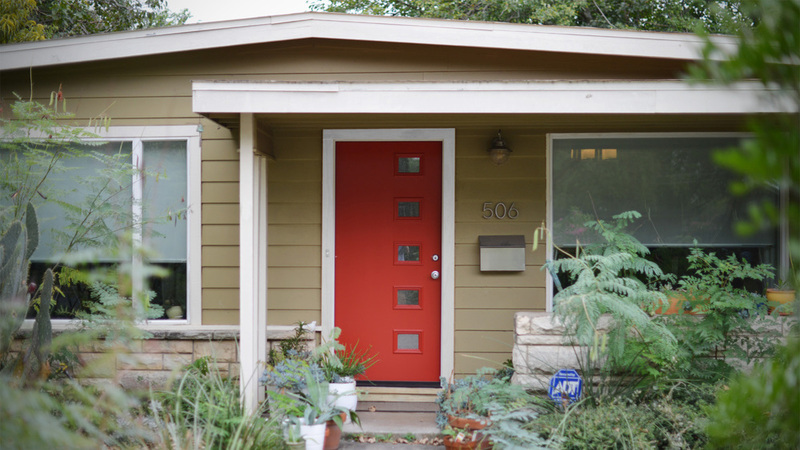 Functionally the new door works much better and aesthetically it looks better, too, but the new door also changes the feeling of the house's interior. The previous door was white on the inside whereas the new one is red. The red ties in nicely with the similarly-colored (knock-off) Eames molded plastic side chairs we have in our Living Room. The new door also has five translucent glass panels which serve to illuminate more evenly the interior of our Living and Dining Rooms. All of this is to say that when it comes to architecture, details matter. Often decisions that seem to be made for purely aesthetic reasons turn out to have larger implications that effect how we live in our homes, work in our offices and learn in our schools. Also, red is a pretty color.